What’s On? 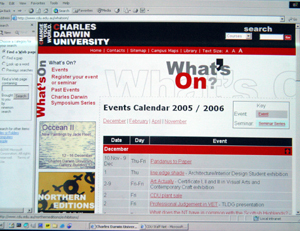 provides a wealth of information about activities on and off campus, including DSO Concert Series, various exhibitions by our talented students and staff, award ceremonies and prize nights, seminars, short courses and workshops, local and national conferences with CDU involvement and the Charles Darwin Symposium Series, among many other great events. Do you have an event (seminar, conference, workshop, short course, concert, exhibition… ) you would like to advertise in What’s On? Why not complete the events/seminar registration form. What’s On? is a great way to promote your event!